My Featured Guest this week is Jill Esbaum, http://www.jillesbaum.com , a much honored and delightful author who writes terrific books. I enjoyed our chats and know that you will too. Thank you, again, Jill! When my three kids were young, we read LOTS of picture books together. That taught me that the best picture books are a) works of art, with text and illustration coming together to form a perfectly fused whole, and b) a form of performance art, with their rich language and dramatic page turns. The ones the kids begged to revisit made me wonder what else it was about those stories that pulled them (and me!) back again and again. Most often, it was an appealing character. Others evoked specific moods. Funny books were favorites, too. A small voice inside me began whispering, You should try this…which I ignored until stumbling upon the info that a local community college was offering a night class titled Writing for Children. I dove in. That was fourteen years ago. After twelve books in print or contracted, I’m still learning – and I feel like I’m just getting started. Writing for kids is the most fun I’ve ever had. I write different types of books, but character-driven stories are my favorites. That calls for creating a character who is appealing and flawed and feels absolutely real – and also has a child-like personality (even if he happens to be a dog or a cow) and a problem kids will identify with. Getting a story on paper doesn’t take more than a couple of weeks, but the “wordsmithing” that follows may take months. My child self and my own (now grown) kiddos. I write at the keyboard, most often in my office. But I sometimes take my laptop elsewhere (especially, on a nice day, outside). I might write notes/thoughts in longhand if I’m having trouble finding a character’s voice or true story. Recently, I fell in love with a character, but wasn’t sure of his story. I forced it, writing him into one, but it didn’t fit. I wrote him into another. Still not right. It wasn’t until I sat down with a pen and legal pad and wrote down the things I knew about him that I finally found his voice and got to the heart of his problem. I do most of my writing during the day. Morning is my most productive time, creatively, but a story is always percolating in the recesses of my mind. It’s a little bit magic, I think, to be stuck at some point of a story and have the answer come to you when you’re out weeding flowers or in line at the grocery store or sitting in a dark movie theater. A writer should never be without a pad/pen. It’s tough to sell picture books right now, but it isn’t impossible. You just have to write something fresh and original and strong and … well, darn near perfect. Read. Read a lot. When it comes to picture books, type out your favorites. Study the form. Think hard about story arc, characterization, word choice. Keep in mind the all-important page turn. YOUR voice is unique, so don’t be afraid to let it rip. And thanks, Jill! Comments anyone? Please post them in the boxes below. 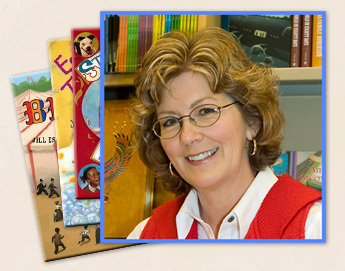 This week my Featured Guest is picture book specialist Jill Esbaum so I know that many readers will look forward to what Jill has to tell us tomorrow. For today, here is a bit about Jill to whet your appetite. Jill Esbaum’s picture books include STINK SOUP, STE -E-E-E-EAMBOAT A-COMIN’!, ESTELLE TAKES A BATH, TO THE BIG TOP, and STANZA. She is also the author of a nonfiction series, Picture the Seasons, for National Geographic Kids. A number of additional titles are forthcoming. It has been a good IRA conference with plenty of time to visit and make new contacts between presentations and signings. My plane leaves this morning at 10 and I’ll be home by 6. Not bad. I hope you poets are thinking about a new poem inspired by the May Word of the Month, which is PROMISE. Several good poems have already been posted but I know we’ll hear from many others in the next few days. This week my Featured Guest will be Jill Esbaum so mark your calendars to read her bio tomorrow and her remaraks on Friday.